By now most readers of DC Comics' "Rebirth" initiative have figured out how the idea of returning to the roots of each beloved character is actually put into writing and artwork: for Superman, it's honoring the legacy of any Man of Steel, for Green Arrow, it's about returning him to his left-leaning roots, and for Wonder Woman, it's... well, complicated. 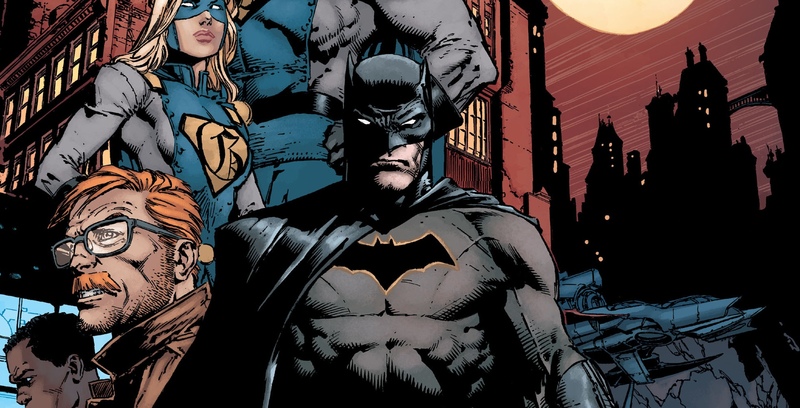 But writer Tom King and artist David Finch face an even more daunting question: are there any aspects of the Batman story that readers could actually find 'refreshing'? After "Batman: Rebirth" #1 added a new partner, while functioning as something of a 'mood piece' - a glimpse of the new, potentially sinister tone for the new series - readers had no clear idea of where the series proper would head. That's changed with "Batman" #1, an issue filled with some tantalizing teases of new villains entering the fray, even more easter eggs, tributes, and nods to fans - and a well-kept secret spilled on the final page (guaranteed to bring the less-visible facets of Bruce Wayne into sharp relief). We're breaking them all down for readers who may have overlooked them, or for casual fans wondering what the 'Reborn' Batman has cooking. King and Finch begin where any true Batman story should - in a clandestine meeting between Bats and Commissioner Gordon next to the Bat-Signal - but once Bruce Wayne heads into his signature set of wheels, the changes from Scott Snyder and Greg Capullo's acclaimed run become clear. It must be a blessing and a curse to design any new Batmobile, but Schmidt has called upon some classic references any longtime fan of the Bat will recognize. The Batmobile is a clear homage to the long, low, rectangular rise from Batman: The Animated Series, with one notable addition: the Bat-head badge placed over the front grill, originally introduced during the superhero's earliest days in the 1940s. Ask anyone who's read "Batman" in their youth, seen cartoon series or live-action films, and it's probably trickled into their subconscious that Bob Kane created the Dark Knight, as surely as Jerry Siegel and Joe Shuster created Superman. But that's not quite the whole story. While Kane took the lion's share of credit for the better part of the past century, the truth is that a few other key players are - historically - seen as responsible. One such player is Jerry Robinson, the artist brought in during the earliest days of the "Batman" comic series. It's Robinson who's credited as the creator of Robin, and generally viewed as having shaped Alfred Pennyworth and Two-Face. But most controversially, Robinson is also viewed by many as the mind that spawned Batman's greatest enemy, The Joker. Asking Bob Kane, Robinson and similarly-overlooked Bill Finger gets you three different accounts, but whatever the case, King and Finch make sure to give Robinson credit in the form of Gotham's Robinson Bridge (and a nod to "52" while we're at it). As mentioned above, King and Finch pay tribute to the creators who came before them - and none has been more overlooked (perhaps in the entire comic book world) than Bill Finger. While Kane retained the sole 'created by' credit, what was spoken about among industry figures has recently spread into the public forum - that it's likely, if not certainly Finger who deserves much of the credit for taking the idea of "a Bat-Man" from a winged crimefighter to the actual iconic hero fans now recognize instantly. Zack Snyder and Warner Bros. took a large step with Batman V Superman: Dawn of Justice, listing the character as 'created by Bob Kane with Bill Finger' in the film's opening credits (as it is in the comics). Here, the comic team pay a tribute of their own, setting a key action sequence of their debut issue near/above/between the Gotham City skyscrapers Kane Plaza and Finger Tower. And, you may notice, Finger Tower is the taller of the two. Probably total coincidence. It's this panel which will likely be the one to scrutinize as the story progresses, since it features more than a few mysterious elements. For starters, there's the corpse of the Kobra soldier - a cult/terrorist group in the DCU initiated by the supervillain of the same name - who seems to have taken his own life. But apparently chose to do so with plenty of un-fired ammunition, setting the explosive story of the issue in motion, and deciding that one shot was enough. His fate is more than likely tied to the shadowy figure standing on the rooftop beside him, delivering a cryptic warning to the passing Batman: "observe the clock." The term may not mean much in a literal sense, although "DC Universe: Rebirth" did end on a fairly familiar clock (of the Doomsday variety), and there is a clock placed in the Gotham skyline previously in the issue (but 10:53 doesn't seem too significant yet). Whatever the case, the mystery man clearly has the upper hand on Batman in one way or another, so we're eager to here the readers' best theories. After doing his best to solve the crisis facing Gotham City - even if it costs him his own safety - Batman braces for the end... only to be rescued himself, in a fashion usually reserved for the Man of Steel. But it's not Superman who saved the Bat - it's two flying superheroes. Fans had known that the first arc of King and Finch's run would focus on the emergence of two new heroes - Gotham and Gotham Girl - but the fact that they would possess superpowers of flight and strength weren't advertised so broadly. To the casual reader, it might seem a serious challenge for Batman. After all, the potential death toll and damage of a single crisis is completely averted by the duo (with not a moment to spare) thanks to powers that Bruce Wayne could never possess himself. Of course, there's a reason why a bright-eyes, heroic strongman isn't the guardian angel(?) of Gotham. So if King and Finch are creating a Superman/Supergirl surrogate to try to tackle Gotham's problems, only to illuminate the very reasons that as dark knight is needed, and vital, it's a compelling story in keeping with the "Rebirth" idea. Batman #1 is available now.